Jeff Lower, (PAR, LLC) MAPPS President, recognized the contributors, including Aerial Services’ President & CEO, Mike Tully. Mike was awarded the “President’s Award” for his six years of service on the MAPPS Board of Directors. 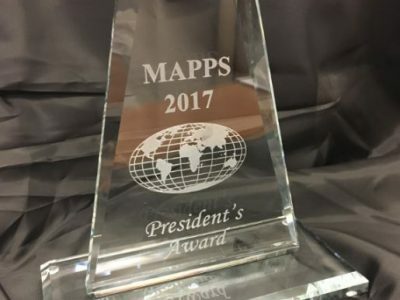 The Management Association for Private Photogrammetric Surveyors (MAPPS), the national association for private sector geospatial firms, recognized a number of individuals for significant contributions to the association and the profession at the Association’s recent annual conference in Sun River, Idaho. Mr. Tully continues to work on behalf of MAPPS as the Program Chair and assists with the planning and development of programs for annual member meetings. Learn more about MAPPS and the next Winter Conference in Las Vegas, NV this winter at MAPPS.org. Amanda Hoppes is the Marketing Manager at Aerial Services. With a BS in Technical Communications, she focuses on technical writing and marketing strategies. Amanda's goal is to 'wear many hats' within the company she works for. She believes having employees who know not only their job, but others' as well, help build a strong and successful business. 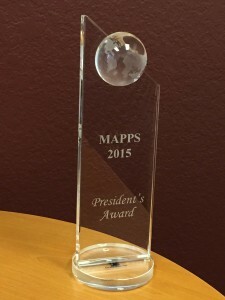 MAPPS President’s Award Won for 7th Consecutive Year! 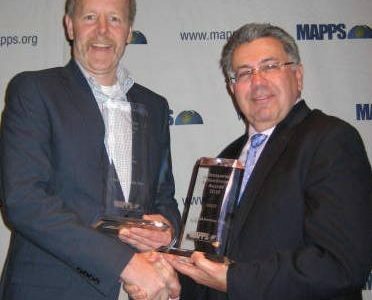 Aerial Services Wins MAPPS Project of the Year!